Tis the season….for shopping! Here is another great excuse to get out this weekend and purchase something. But at least you can leave the long lines from the mall behind and support your local craftsman. And while you’re at it, you can leave with a handmade specialty gift for the person on your list. 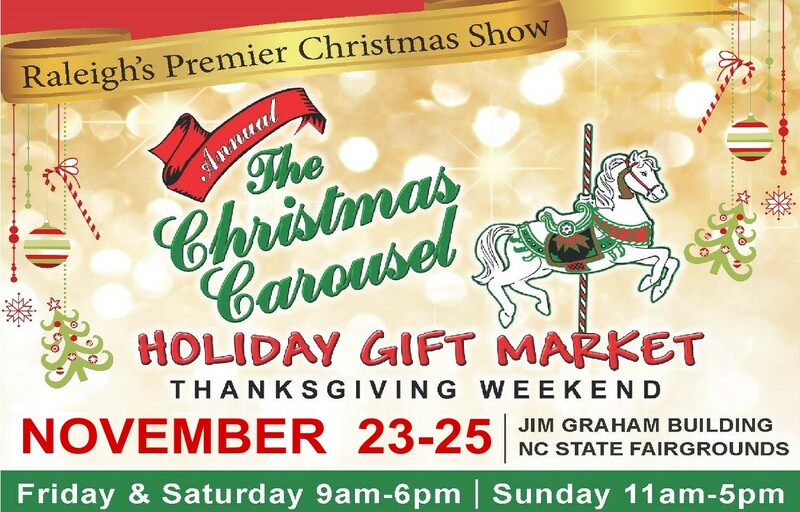 If you live in the Triangle, you have probably heard of or have been to the Christmas Carousel market. This event is touted by some as the largest holiday markets in the area, which is impressive considering the sheer number of gift buying opportunities nearby. In its 31styear, the market provides a collection of arts, crafts and holiday centric gifts with over 250 exhibitors. This is a high quality arts and crafts affair so expect superior products and variety not bargain prices. With so many booths to peruse make sure you give yourself plenty of time- come early and leave late! Don’t leave the kids at home either, the big man in the red suit will be there all three days so bring a camera and make some memories. Check out the event website for more information including a list of exhibitors.